I had a nice conversation with Jack Welch yesterday that eventually will be an article here. 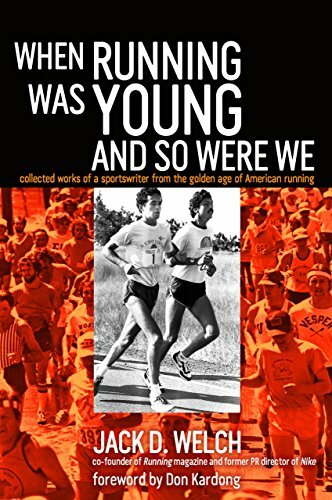 If you're a runner, by the way, and want to see the difference between runners today and in the far, far past, all the way back to 1980, Jack's Book, When Running Was Young and So Were We is a terrific read. Something that Jack said that was writing related rather than running caught my attention and riffed with an article I came across about the legendary runner, Marty Liquori. Jack said he wrote well on deadline, with money on the line. We'll get to Marty in a second. My books I published on my own timeline and, right now, I'm stressing over getting to Lonesome Mile again while I finish my non-fiction book. I'm writing the articles over at InlandXC which will never earn a dollar. I know that going in, and I'm cool with it. I'm not writing so much for the money as for the chance to share a few thoughts and emotions. “So if you love running, you’ll become a good runner because it’s fun to you. If you hate running, then you probably should be playing baseball or something else. The quote comes from a site called Gainesville Observed and is part of a larger article on the jazz playing nature of this great runner. It sticks with me because, more than ever, I'm doing things that I love. It's hurt my income to an extent since I'm a male in prime working years who has deliberately scaled back. That, for those that want to know, is a scary thing to do and the trepidation does not take a rest break. It shows up each work hour that I spend coaching or writing about runners. Deep breathing helps, a lot. For me, the writing is play, making stuff up as I go. That might be something I should add to my list of things to be grateful for.